Made just for our dear @Quirkly, because he deserves this. Really puts it into perspective. I wish it could be daylight all the time, brings a tear to my eye. 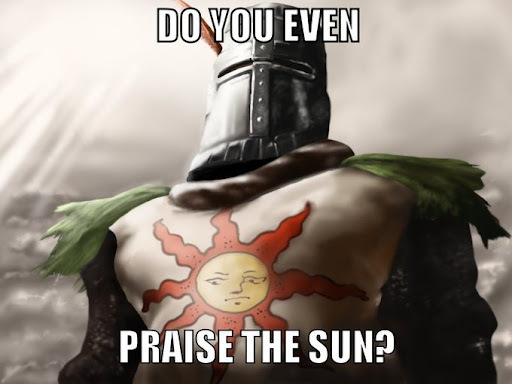 I dont get the praise the sun references. At first I thought it was Monty Python but I guess I am wrong? Yeah, me neither…I think it is from the video game Dark Souls. Could be wrong. Either way, @Quirkly needed this thread to be happy. Yep Dark Souls. Such a great game. Okay wait no, I think Evolve is still a solid #1 on my list still. I’m not sure what it’ll take to dethrone it, … probably a lot of time. Yes, Evolve is definitely the most fun I’ve had in a game for a long time. I didn’t expect this much quality from a purely multiplayer game, to be honest. I was pleasantly surprised. Dark souls is definitely the most challenging game I have played and is up there as one of my favourites. I enjoyed the hell out of the game…until i reached the gremlins with the “toxic” poison. ragequit qq. I just wish the summon ally was easier to do. playing the game together with my brother was 10x more fun and still hard as hell.